Notes: M-120 was formerly designated as a part of M-20 until that highway was rerouted to end at New Era in Oceana County. One relic of this route's heritage as M-20 can be seen to this day in the exit signage on US-31 near Muskegon. The signs list Big Rapids as one of the destinations on M-120, although Big Rapids is more than 45 miles distant via two different highways. Prior to 1969, though, the signs would have been completely correct. The termini designations for M-120 have been changed to western and eastern from northern and southern as the highway is actually signed as an east-west route in the field. Interestingly, M-120 is more than twice as long in the north-south direction as it is from east to west! The seemingly incorrect signing for this highway is another relic from its history as part of east-west M-20. History: 1930 (Jun 30) - A new, 0.7-mile long state trunkline spur route is created when Logan St in northwest Lansing from US-16/Grand River Ave northerly to Sheridan Rd on the Ingham/Clinton Co line is transferred to the state. The new highway is designated M-120 and serves a complex of state facilities clustered along that portion of Logan. 1938 (Dec 6) - On this date, the original routing of M-174 as a spur route from US-112/M-60 south of Buchannan northerly into downtown Buchannan is cancelled as a state trunkline and it is likely that designation is soon after transferred to and supplants the M-120 designation at Lansing. The M-120 designation will be re-used on a routing along the Ohio state line in the next year. 1939 (Jul 13) - Morenci Rd from US-127/Meridian Rd on the Hillsdale/Lenawee Co line easterly through Morenci (via Main St) to the Ohio state line (connection w/OH SR-568) two miles east of downtown Morenci is transferred to state control and designated M-120. Interestingly, official state maps show M-120 continuing westerly for an additional 24.1 miles through southern Hillsdale Co via Territorial Rd to the Indiana state line (connection w/IN SR-120), even though the Hillsdale Co portion has not yet been transferred! Why the State Highway Dept marked this part of the route on maps 18 months prior to its official determination is unclear. 1940 (Nov 12) - Territorial Rd in Hillsdale Co from the Indiana state line (connection w/IN SR-120) easterly to jct M-120 & US-127 on the Hillsdale/Lenawee Co line is transferred to state control and designated as an extension of M-120. 1961 (Jun 21) - The Lenawee Co portion of M-120, from the Ohio state line east of Morenci to US-127, is transferred back to local control. 1961 (Jul 11) - The Hillsdale Co portion of M-120, from the Indiana state line easterly to US-127, is also transferred to local control, signaling the end of the second iteration of M-120. 1969 - M-20 is rerouted to run due westerly from the White Cloud area through Hesperia to New Era. The portion of the former route of M-20 from BUS US-31 at Muskegon northeasterly via Twin Lake to M-82 west of Fremont is designated as M-120. From the jct with M-82 northerly to Hesperia, M-120 is concurrently designated with M-82 to a common terminus at the new M-20 routing. c.1978 - Since the final 7 miles of both M-82 and M-120 were co-signed with each other, it was inevitable one would lose out and be truncated back to the M-82& M-120 jct west of Fremont. That's exactly what happened in the late 1970s. The first Official Michigan Highway Map without the concurrent M-82/M-120 routing from west of Fremont to Hesperia is issued in 1979, implying the M-82 designation was scaled back in the 1978 season. The Official map has been less-than-accurate before, however, so the exact time of the change is unclear. It is hoped further research will clarify the matter. Freeway/Expwy: No portion of M-120 is freeway or expressway. NHS: From southern terminus at BUS US-31 in Muskegon to US-31 northeast of Muskegon. Circle Tour: Lake Michigan Circle Tour: From southern terminus at BUS US-31 in Muskegon to US-31 northeast of Muskegon. Weblinks:  M-120 @ Michigan Highway Ends - photos of the termini of M-120 at Dan Garnell's excellent Michigan Highway Ends website. Western Terminus: Cnr Chicago Dr & E Main Ave on the east side of Zeeland, immediately west of BL I-196/Byron Rd. Notes: While M-121 is Michigan's newest state trunkline designation, it runs along a route which has been on the trunkline system since 1922; it also uses a designation which has occupied two other routings over the years. M-121 originally existed in the eastern Upper Peninsula from 1931 to 1935, then was designated along a route in the Flint area from 1935 to 2003. Meanwhle, a route which had been part of M-21 from 1926 until the completion of I-196 in the area in 1974. Initally, Chicago Dr was a two-lane highway running parallel and to the south o the CSX Railroad line, but in the 1950s the State Highway Department added a second set of lanes to the south, converting the route into a four-lane divided highway. From 1974 until 2007, Chicago Dr from Zeeland to Jenison was an unsigned state trunkline designated internally by MDOT as OLD M-21. Sources have noted that MDOT had wanted to turn Chicago Dr between Zeeland and Jenison back to local control since being superceeded by I-196/Gerald R Ford Frwy within two miles to the south. However, mounting traffic volumes and the fact that the Ottawa Co Road Commission was reticent to take back such a major highway that had several deficient sections. The original westbound lanes—especially west of Hudsonville—had never been completely rebuilt since the 1920s, while the newer eastbound lanes built in the 1950s were of much higher construction. MDOT had reportedly wanted to simply close the westbound lanes, reverting Chicago Dr back to a two-lane highway. Local officials were understandably unhappy with this plan. In 2007, MDOT announced a new plan to tack an additional two lanes (three at some major intersections) to the north side of the higher-quality eastbound lanes, resulting in a 4-5 lane highway between Zeeland and Hudsonville. From Hudsonville easterly to Jenison, Chicago Dr will remain a four-lane divided highway. It was also at this time the state decided to re-sign the highway with a trunkline designation: M-121. The $15-17 million reconstruction project is scheduled for the 2010-2011 timeframe, depending on funding. In its previous iteration, the M-121 designation ran via Bristol Rd in the Flint area for its entire length and primarily served to provide access to Bishop International Airport from I-75/US-23 and I-69. At one time, M-121 stretched easterly to end at M-54/Dort Hwy, but was scaled back to I-75/US-23 first, then was completely "downloaded" in 2003. The last length of this second M-121 iteration was 2.10 miles. In the 1990s, MDOT completely overhauled M-121 between I-69 and I-75/US-23, first relocating it north of the new Bishop Airport terminal complex, then later in the decade realigning the highway once again via a new overpass spanning the busy CN Rail line just west of the airport. History: 1931 (Jan 12, May 6) - A new direct route for US-2 from the present-day jct of H-63/Mackinac Trail & M-134 in Mackinac Co to Dafter in Chippewa Co is determined as a state trunkline, but not yet constructed. The present route of US-2 easterly from Mackinac Tr to M-5 (present-day M-129) north of Cedarville and northerly via present-day M-129 through Pickford to Sault Ste Marie retains the US-2 designation for the time being. 1935 (Jan 7) - A major realigning and reconfiguring of the state trunklines in eastern Mackinac & Chippewa Cos occurs at this time. The highway which had been designated M-121 now turns southerly from the cnr of St Ignace & Three Mile Rds via Three Mile into Hessel, then easterly via State Rd, southerly via Blind Line Rd and easterly again into Cedarville and M-5. At this time, the US-2-to-Cedarville trunkline is redesignated from M-121 to M-4 and the new M-4 designation is continued easterly via a proposed trunkline extension from Cedarville toward DeTour Village. Simultaneously, the portion of M-121 from the jct of M-5 north of Cedarville northerly to Sault Ste Marie is redesignated as an extension of M-5. Thus, the first iteration of M-121 comes to a close. 1935 (Jan 7) - The same day many of the above Eastern U.P. changes are made, the 6.5 miles of Bristol Rd in Genesee Co from M-78/Miller Rd on the west to US-10/Dort Hwy on the east becomes a state trunkline and is designated M-121. This route, which does not come in contact with M-21 but run parallel to it three miles to the south, first appears on official highway maps in 1936. 1941 - The final portion of gravel-surfaced M-121, from M-78/Miller Rd to US-23/Fenton Rd, is paved. 1970 (Jan 30) - With the completion of the M-78 freeway (present-day I-69) between Swartz Creek and downtown Flint, the portion of M-121 from the freeway westerly to OLD M-78/Miller Rd is turned back to local control. 1971 - When the M-21 designation is added to the M-78 freeway between Lennon and Flint, the routes of M-21 and M-121 come in contact with each other for the first time—after being with three miles of each other for 36 years. 1991 - All of M-121 in Flint east of I-75/US-23 is transferred to local control, leaving only the portion between the two freeways: from I-69 on the west to I-75/US-23 on the east. c.1992 - Due to an expansion at Flint Bishop International Airport, M-121/Bristol Rd is realigned around the north side of the airport. 2000 (Jun 30) - The segment of M-121/Bristol Rd just west of the portion realigned in c.1992 around the north side of Bishop Airport is itself realigned via a new overpass spanning the Canadian National RR line. This overpass and realignment is opened to traffic on June 30. 2003 (Dec) - The remaining 2.3 miles of M-121 are transferred to county control in December 2003. MDOT had initiated the transfer process in 2001. 1982 (Oct 20) - The segment of the former BUS M-21/Chicago Dr from the ebd I-196 off ramp in Grandville (at Exit 69) westerly to the Kent/Ottawa Co line is turned back to local control. 1985 (Dec 1) - The portion of the former BUS M-21/Chicago Dr from downtown Grandville at Wilson Ave northeasterly to the Grandville/Wyoming city limit is turned back to local control. 2007 (Aug)- MDOT officials announce plans to improve the portion of OLD M-21/Chicago Dr between Zeeland and Hudsonville. Also at this time, a new posted route designation is revealed for Chicago Dr from Main Ave at Zeeland to the Ottawa/Kent Co line at Jenison and Grandville: M-121. As of December 2007, M-121 route markers have not been posted, however. Freeway/Expwy: No portion of M-121 is freeway or expressway. Notes: The route of M-123 is rather interesting in that from I-75 and Paradise it is essentially a north-south highway, but then heads westerly from Paradise through the Tahquamenon Falls area, then arcs south to Newberry, becoming a north-south highway (or south-north highway, as it may be) at that point. Thus, the "northern terminus" is south of nearly half of the length of the route! This highway serves as a popular route for tourists, directly connecting I-75 north of St Ignace with Tahquamenon Falls State Park, featuring two large waterfalls—one the largest waterfalls west of Niagara Falls! M-123 also provides access to other points of interest, such as the community of Paradise, Whitefish Point Lighthouse & Maritime Museum, the Curley Lewis Scenic Byway and the community of Newberry. By 1934, the determined (but not yet constructed) trunkline route from Nunica through Fruitport into Muskegon Heights is redesignated as M-126. In the end, the M-123 designation along this route is only used during the planning process and never actually signed along the route. During 1934, a ten-mile stretch of new highway is constructed in western Chippewa Co, from M-28 one mile south of Eckerman northerly to Sec 18, T47N R6W (just south of East-and-West Rd), 9 miles north of Eckerman. While not officially determined as a state trunkline route yet, this 10-mile long route is "marked and maintained" as a new routing of M-123. 1935 (Jan 7) - The ten miles of M-123 highway built in 1934, plus 6.3 additional miles from south of East-and-West Rd northerly to the mouth of the Tahquamenon River at the community of Emerson are assumed into the state trunkline system. Official documents note the highway was only maintained for the first ten miles north of M-28, though, with the remainder to Emerson continuing to be maintained by the county as a county road. 1937 (Aug 30) - The official trunkline routing for M-123 from Eckerman in western Chippewa Co had the highway running due southeasterly from Eckerman to M-28, while it used the previously-constructed highway running due southerly to M-28. On this date, the proposed southeasterly alignment is cancelled and the due southerly route is officially assumed into the trunkline system. 1939 - The existing 10 (maintained) miles of M-123 are completely hard-surfaced. 1954 (May 15) - The length of M-123 is increased by 33.5 miles from M-28 south of Eckerman to US-2 north of St Ignace. From M-28 southerly to Trout Lake, 10.5 miles of new trunkline are determined. At Trout Lake, M-123 is signed concurrently with M-48 for approximately one mile before again striking out southeasterly on 22.0 miles of newly-determined trunkline via Moran and Allenville, terminating at US-2 at Rogers Park, 8 miles north of downtown St Ignace. All 33.5 miles of new trunkline mileage are gravel-surfaced. 1954 - In addition to the southerly extension noted above, the April 1 edition of the official highway map indicates M-123 is extended (marked and maintained) northerly to the Tahquamenon River bridge at Emerson. However, the October 1 map shows the northernmost five miles of this new "extension" once again maintained as a county road, for a net gain (from 1953) of two miles. 1957 - The northerly extension of 1954 to the Tahquamenon River bridge at Emerson is shown again on official maps starting this year. It seems as if this portion of the route is now fully signed and maintained as part of M-123, event though it had been determined this far north in 1935. 1961 (Nov 15) - Two sharper curves along M-123 at Castle Rock Rd and at the hamlet of Allenville are replaced by more sweeping curves. Much of the former route is obliterated and removed as public ways. In addition, during 1961 the last remaining gravel-surfaced sections of the highway, from US-2 to the Mackinac/Chippewa Co line and from M-48 at Trout Lake to M-28, are paved. 1962 (May 18) - A total of 37.78 miles of new state trunkline are determined from the northern terminus of M-123 at the Tahquamenon River bridge south of Paradise northerly to Paradise, then westerly through Tahquamenon Falls State Park then southwesterly into Luce Co to the northern terminus of M-117 at Four Mile Corner north of Newberry. This entire new trunkline is designated as an extension of M-123, while the 8 miles of M-117 from Four Mile Corner southerly through Newberry to M-28 south of Newberry is redesignated as a further extension of the route. 1963 (Dec 5) - With the completion of the I-75/US-2 freeway northerly from M-123 toward Rudyard, the 2/10 mile of M-123 from the new freeway to the former US-2 along H-63 is cancelled as a state trunkline. Freeway/Expwy: No portion of M-123 is freeway or expressway. Circle Tour: Lake Superior Circle Tour: From "northern" terminus south of Newberry to eastern jct of M-28 near Eckerman. Pure Michigan Byway: Tahquamenon Scenic Byway - This the name of this Scenic Heritage Route first evolved into the Tahquamenon Scenic Heritage Route. Then as the entire Heritage Routes program transitioned to the Pure Michigan Byways branding in 2015, this route was one of the first to similarly rebrand as the Tahquamenon Scenic Byway. Weblinks:  M-123 @ Michigan Highway Ends - photos of the termini of M-123 at Dan Garnell's excellent Michigan Highway Ends website. Notes: This highway forms the north and east sides of the state highways which encircle Wamplers Lake on the Lenawee/Jackson county line. While M-50 runs along the west side of the lake, and US-12 runs along the south side, M-124 begins on the east side by dissecting Walter J Hayes State Park, then curves westerly toward M-50 at Brooklyn. M-124 actually began as a short access highway serving the state park from US-112 (now US-12). History: 1928 (Jun 28) - A 1.4-mile long trunkline is determined in northern Lenawee Co (1.3 mi) and southeasternmost Jackson Co (0.1 mi) beginning at US-112 (present-day US-12) in the Irish Hills 4 miles east of Cambridge Junction and proceeding northerly to Cedar Hills State Park, serving as a state park access road. 1931 (June 19) - The State Administrative Board approves a short extension of M-124 in Cedar Hills State Park as part of 30 additional miles of roadway approved to be added to the trunkline sytem. 1931 (Aug 17) - A 4/10 mile extension of M-124 is established northerly from the northern terminus of the highway in southeastern Jackson Co. Also at this time, Cedar Hills State Park is renamed Walter J Hayes State Park. 1932 (Early Aug–Oct 29) – A slight realignment to M-124 in Lenawee Co from US-112 northerly into W J Hayes State Park is completed and opened to traffic in early August. Then on Oct 29, the realignment is made official when it is assumed into the state trunkline highway system. The former route of M-124 along Hane Hwy northerly from US-112 for a short distance is turned back to county control, while a portion of the former route through W J Hayes State Park is incorporated into the park access roads. The remainder of the old route is obliterated. The former route was 1.3 miles in length while the new route is one tenth of a mile shorter. 1933 (May 27) - M-124 is no longer a spur route when 6.5 miles of additional trunkline are determined from the northern terminus of M-124 westerly to M-50 in Brooklyn. 1939 (Jul 13) - The westernmost 2 miles of M-124 are realigned, shaving 3/10 miles from the route. Part of the former route is obliterated, while the portion of Monroe Pike north of Wamplers Lake Rd is turned back to local control. With this realignment, the entire route of M-124 is now paved. Freeway/Expwy: No portion of M-124 is freeway or expressway. Weblinks:  M-124 @ Michigan Highway Ends - photos of the termini of M-124 at Dan Garnell's excellent Michigan Highway Ends website. Notes: M-125 is designated as such since the highway traverses a portion of the former US-25 in Michigan. This highway runs mostly-parallel to, and within approximately 1–2 miles of, US-24 for its entire length. As such, according to some MDOT sources, M-125 has long been a "turnback candidate" whereby MDOT would prefer to transfer the road to the local authorities and the route would no longer be designated M-125. The portion of M-125 through downtown Monroe was designated as one of Michigan's first Historical Heritage Routes. From MDOT: "The City of Monroe in conjunction with MDOT nominated the portion of M-125 which runs through the Old Village Historic District, and is contiguous to the East Elm - North Macomb Historic District, and the Custer Equestrian Monument." History: 1931 (June 19) - The State Administrative Board approves a new short spur highway to serve the new Thompson State Fish Hatchery as part of 30 additional miles of roadway approved to be added to the trunkline sytem. 1931 (Aug 31) - A new 1.5-mile state trunkline spur, designated M-125, is determined 5 miles west of Manistique beginning at US-2 and continuing southerly to the Thompson State Fish Hatchery just north of Thompson. 1935-36 - A new, southerly routing for US-2 between Cooks and Manistique via Thompson is constructed over these two years. This new alignment of US-2 passes a little over a mile south of the current southern terminus of M-125 at the Thompson State Fish Hatchery. It isn't until the next year the former route of US-2 is "decommissioned" and the route of M-125 is extended southerly to meet up with the new US-2 routing. 1937 (Aug 30) - As noted above, much of the former route of US-2 between Cooks and Manistique along present-day Co Rd 442 is turned back to local control, with the exception of the portion between M-149 and M-125. An additional 1.35 miles of new state trunkline is tacked onto the southern end of M-125, connecting with the new US-2 at Thompson. The State Highway Dept then redesignates the entire trunkline beginning at US-2 at Thompson then northwesterly to Palms Book State Park as M-149, thus brining an end to the first iteration of M-125. 1938 (Dec 6) - Parish Rd from US-23 (present-day M-13) to Seven Mile Rd in central Bay Co is assumed into the state trunkline system at a length of 3.0 miles and is designated M-125. The overall purpose for this short spur route is not clear. 1945 - All three miles of M-125 are hard-surfaced. 1957 (Jun 24) - The short 3-mile spur trunkline designated M-125 in Bay Co is transferred back to local control. As noted above, the purpose for this route was never evident. 1974 - With the decommissioning of all of US-25 in Michigan (and Ohio), several segments of state trunkline which formerly bore only the US-25 designation are given other route numbers. US-25 in Monroe Co via Dixie Hwy from the Ohio state line to US-24/Telegraph Rd north of Monroe is redesignated M-125. Freeway/Expwy: No portion of M-125 is freeway or expressway. Pure Michigan Byway: Monroe Street Heritage Route - From MDOT: "M-125 through the City of Monroe was designated as a Historic Heritage Route. The City of Monroe in conjunction with MDOT nominated the portion of M-125 which runs through the Old Village Historic District, and is contiguous to the East Elm–North Macomb Historic District, and the Custer Equestrian Monument." Weblinks:  M-125 @ Michigan Highway Ends - photos of the termini of M-125 at Dan Garnell's excellent Michigan Highway Ends website. Notes: The history of US-127 is an interesting one. Originally intended to be a shortish spur-routing from its parent, US-27, starting at Lansing and running southerly to Jackson turning southeasterly via Adrian to a terminus in Toledo, Ohio, the US-127 of today runs from Grayling, Mich. southerly to Chattanooga, Tenn.! In 1930, US-127 was removed from its Toledo routing and, instead, continued southerly into Ohio where it continued via Cincinnati, through Kentucky and Tennessee, ending just shy of Georgia in Chattanooga. Then in 1999-2002, when all of its parent route in Michigan was decommissioned and relegated to history, US-127 was again extended northerly through much of the Lower Peninsula to end just south of Grayling. As noted above, MDOT petitioned AASHTO in 1999 to truncate US-27 at Lansing (at jct I-69/US-27 & US-127 near DeWitt) and then extend US-127 over the length of the former US-27 from Lansing to I-75 at Grayling. (MDOT and InDOT then petitioned to have US-27 removed altogether from the I-69 concurrent routing between Lansing and Fort Wayne, Ind.) Some applauded this move as an attempt to simplify route numbering along what effectively became one corridor while others questioned the necessity of such a major, costly and disruptive change. In the end, all of US-27 north of I-69 at DeWitt was re-signed as US-127 in the Spring of 2002 and all BUS US-27 routings from St Johns to Harrison were redesignated as BUS US-127 routings. During the mid-1990s, after the U.S. Congress had created a "High Priority Corridor" from Detroit to Myrtle Beach, South Carolina and gave that corridor the "I-73" route designation, MDOT requested the corridor be moved west in Michigan to run from Toledo northwesterly to Jackson, then northerly via US-127 and US-27 past Lansing, Mt Pleasant and Clare to Grayling, thence northerly via I-75 across the Mackinac Bridge to Sault Ste Marie. The hope was to be able to capture additional federal funding to complete the non-freeway segments of this route (Ottawa Lake-Jackson and St Johns-Ithaca) and upgrade the substandard portions already "freeway-ized" (e.g. the US-127 Jackson Bypass), then designate the corridor from Toledo to Grayling as I-73. Studies were performed through the late-1990s and in June 2001, MDOT announced a halt to all further I-73 studies, instead opting to use that money to improve deficiencies in the existing corridor instead. With the amount of money MDOT spent on new US-127 signage north of Lansing in 2001-02, one could speculate the corridor will retain its existing route designations for quite some time. History: 1926 - One of the original "1926 U.S. Highways," US-127 is designated to run from Toledo, Ohio via Jackson to US-27 at Lansing. Specifically, US-127 is to replace the following former highway designations: M-34 from the Ohio state line near Sylvania to Adrian (via present-day US-223), M-80 from Adrian to M-14 north of Addison (via present-day US-223), M-14 from north of Addison westerly US-112 (formerly M-23) to Somerset Center, then northerly via Jackson Rd through Jackson and on to Lansing generally via its present-day route to Mason and via Cedar St from there to its ending. At Lansing, US-127 will terminate at US-27 at the cnr of Cedar St & Kalamazoo Ave. Maps indicate M-14 is not completely removed from all of the route of US-127, however, remaining concurrently designated with US-127 from Jackson southerly to north of Addison. At Jackson, US-127 will enter the city from the south via Fourth St, veering northeasterly via Greenwood Ave, jogging west for ½ block on Morrell St, then northerly via Blackstone Ave, before veering northwesterly out of town via Lansing Ave.
1927 (May 15) – The new US Highway designations across the state of Michigan officially become effective today, with US-127 superceeding portions of the routes of M-34, M-80, and M-14, as noted above. (Jun 24) - A minor realignment near Ottawa Lake (just north of the hamlet of Ottawa Lake) in southwestern Monroe Co shaves about 1/10 mile from the route. (Sept 9) - Another minor realignment at Rome Center in western Lenawee Co adds 2/10 mile to the route of US-127 (present-day US-223) with part of the former route turned back to local control and the rest obliterated. 1928 (May 25, Jun 28) - From 1926-28, the route of US-127 through Mason, essentially the former route of M-14 through town, is: from the south via Jefferson Ave, northwesterly via Lansing St to Ash St, westerly via Ash to Cedar St, then north and northwesterly via Cedar St. On May 25, Jefferson Ave from cnr of Lansing St (jct US-127) northerly into downtown to M-36/Ash St is transferred back to state control. (It had been a trunkline from 1919-1923) On June 28, Ash St from Jefferson Ave westerly to US-127/Lansing St was similarly transferred to the state. While the US-127 mainline remains on Lansing St bypassing downtown, the Jefferson-Ash route becomes an alternate routing. It is unclear at this time what route designation it bears, but one could assume it is signed US-127A. 1929 (May 20) - The beginnings of a new western "bypass" of the downtown area of Jackson is formed when St Clair Ave (from Lansing Ave westerly to N West Ave), N West Ave (from St Clair Ave southerly to Ganson St), and S West Ave (from Glenwood Ave southerly to High St) are transferred to state control. While not completely under state control, it appears this "downtown bypass" is signed as the US-127 mainline route at this time. 1930 - A major change comes to the routing of US-127 when, instead of turning southeasterly via Adrian toward Toledo, Ohio, the routing now continues due southerly into Ohio and on toward Cincinnati via M-14, which is completely supplanted. The former route of US-127 through Adrian, Blissfield and Ottawa Lake and into Ohio near Sylvania is redesignated as a brand-new U.S. Highway designation: US-223. 1931 - Act 131 of 1931, which allows for the control of in-city streets as state trunklines by the State Highway Dept, helps to complete the 1929 "downtown Jackson bypass" when West Ave from Ganson St southerly to Glenwood Ave, High St from S West Ave easterly to Fourth St, and Fourth St from High St southerly to the New York Central RR south of Prospect St are transferred to state control. The route of US-127 through Jackson, now all under state control, runs from the south via Fourth St, High St, West Ave, St Clair Ave and Lansing Ave.
1932 (Oct 29) - Part of the former "downtown route" of US-127 into Jackson from the north along Lansing Ave from St Clair Ave southerly to Clinton Rd is transferred back to city control. 1950 (Nov 3) - When US-27/M-78 is realigned in downtown Lansing to cross the Grand River via a bridge on Main St to Cedar St, then northerly via Cedar St to Kalamazoo St, the route of US-127 via Cedar St is scaled back several blocks to end at US-27/M-78 at the cnr of Main St & Cedar St.
1953 (Nov 6) - With the completion of the US-12 "Jackson bypass," the portion of US-127 in Jackson from the cnr of N West Ave & St Clair Ave easterly via St Clair to Lansing Ave, then northerly via Lansing Ave to the new US-12"Jackson Bypass" is transferred to local control. US-127 now continues northerly from Jackson concurrently with M-50/Clinton Rd to the US-12 bypass, then easterly via US-12 to Lansing Ave, then northerly again on its existing alignment. 1954 (Jan 4) - A new western bypass of Mason from just north of Tomlinson Rd south of the city northerly to Cedar St on the west city limit (southeast of Howell Rd) is determined and the former route in the City of Mason via Lansing St from Jefferson Ave to Ash St and along Cedar St from Columbia Rd northwesterly to the new bypass are turned back to local control. Simultaneously, Columbia Rd from Cedar St westerly to the new bypass is transferred to state control as part of a business connection. Now, a BUS US-127 routing begins at the southern end of the Mason bypass just north of Tomlinson Rd and continues northerly via Hull Rd and Jefferson Ave into downtown, then turns westerly concurrently with M-36 via Ash St, then northerly via Cedar St, and westerly again via Columbia Rd, where both M-36 and BUS US-127 now terminate at the new bypass. 1955 (Nov 18) - An entirely new alignment for US-127 from jct US-112 & US-223 in northwesternmost Lenawee Co northerly into Jackson Co to M-50 southeast of Jackson near Vandercook Lake is officially added as a state trunkline, running generally along the line of existing Meridian Rd, but immediately west of that road. From the jct with M-50, US-127 now runs concurrently with M-50 into Jackson via Brooklyn Rd & Prospect St. The former route of US-127 from US-112 at Somerset Center northerly via S Jackson Rd to the southwest corner of Jackson is turned back to local control. 1956 (Nov 16) – A seven-mile long stretch of new US-127 expressway (access only at select crossroads—in this case, at Covert, Barnes and Tomlinson Rds) is completed and opened to traffic from Kinneville Rd (near N Main St) northwest of Leslie, northerly to the BUS US-127 junction at the southern end of the existing US-127 Mason Bypass south of Mason. The new expressway is constructed immediately to the west of existing US-127 with the former route along Hull Rd becoming an easterly service road for the new highway, while a new westerly service road (Churchill Rd) is constructed to give access to property to the west of US-127. The nearly $2 million project, which is completed nine months ahead of schedule and also includes a second set of lanes added to the existing US-127 Mason Bypass, completing the four-lane divided expressway from just north of Leslie to northwest of Mason. Interestingly, this new portion of US-127 will not be officially determined as a state trunkline for 2½ more years! 1957 (Dec 30) - A new expressway alignment for US-127 from the US-12 "Jackson bypass" northerly to the Jackson/Ingham Co line is determined and the existing route of US-127 via Lansing Rd from US-12 northerly to the county line is turned back to local control. It seems, however, the new expressway is not complete until the next year. 1958 (Sept 16) - Official determination of the new US-127 expressway alignment continues into Ingham Co from the northern end of the expressway determination from December 30, 1957 northerly past Leslie to the southern end of the completed expressway at N Main St at Leslie is made. The former route of US-127 through Leslie via Jackson Rd, Fitchburg Rd, Mill St and Main St is turned back to local control. 1959 (Mar 25) - The expressway segment from northwest of Leslie northerly to south of Mason completed in 1957 (see above) is officially determined as a state trunkline highway on this day, with the former route via Hull Rd from N Main St to north of Tomlinson Rd is now officially turned back to local control. 1959 (Nov 6, Nov 21) - An 5.65-mile long eastern freeway bypass of Jackson from the jct of US-127 & M-50 southeast of Jackson northerly to I-94/US-12 northeast of Jackson is opened to traffic on Nov 6 and officially assumed into the state trunkline system two weeks later on Nov 21. The US-127 designation is routed northerly via the new freeway to I-94/US-12, then westerly concurrently with I-94/US-12 to the jct of I-94/US-12 & US-127/M-50 northwest of Jackson. The former route of US-127/M-50 through Jackson becomes M-50/BUS US-127. 1964 (Oct 15) - Several trunkline reroutings at Mason. First, the portions of BUS US-127 via Hull Rd and Jefferson Ave from US-127 south of Mason northerly to M-36/Ash St downtown and the portion of M-36/BUS US-127 via Columbia Ave from Cedar St westerly to US-127 are transferred back to local control, signaling an end to Mason's BUS US-127. The 1926–1954 route of US-127 via Cedar St northwesterly from Columbia Ave is re-added as a state trunkline, designated as M-36 from Columbia out to the new US-127 freeway interchange northwest of the city. 1966 (Oct 14, 9:00 am, Nov 18) - The new, $8-million US-127 freeway from Cedar St at Mason to jct I-96 & I-496 is completed and opened to traffic at 9:00 am on Oct 14, while it is officially determined as a state trunkline route a month later on Nov 18. The US-127 designation travels northerly from Mason via the new freeway to I-96, then continues northerly via I-496/M-78 into Lansing/East Lansing, where the freeway ends and US-127 utilizes the one-way pair of Homer & Howard Sts northerly to M-43/BUS M-78 at Grand River Ave-Saginaw St. There, US-127 turns westerly via M-43/BUS M-78/Grand River Ave-Saginaw St to a terminus at US-27 at Cedar-Larch Sts. The former route via Cedar St from Mason to the south side of Lansing at I-96 temporarily remains a state trunkline highway while Cedar St from I-96 northerly into downtown Lansing is redesignated as BL I-96. 1966 (early Nov) - The remaining at-grade intersections along US-127 between Jackson and Mason are either eliminated or converted to grade separations (overpasses and underpasses) and interchanges, with the project completing in early November. US-127 is now a fully limited-access freeway from Jackson to Lansing. 1967 (Apr 3) - The former route of US-127 via Cedar St, 7.537 miles from the US-127 interchange at Mason to jct BL I-96 on the south side of Lansing is turned back to local control. 1968 (Oct 22) - The US-127 freeway from the on- and off-ramps at Kalamazoo St on the Lansing/East Lansing border northerly into Clinton Co and to US-27 at present-day I-69 Exit 87 is officially determined as a state trunkline, although the freeway is not yet complete at this time. 1969 - A short segment of the US-127 freeway on the Lansing/East Lansing line from south of Kalamazoo St to Grand River-Saginaw is completed. Homer & Howard Sts, now the frontage streets running parallel to this segment of the freeway and the former route of US-127/M-78 since late 1966, are both retained as unsigned/old state trunkline routes, both designated OLD US-127. 1973 (Fall) - A northerly extension of the US-127 freeway is completed and open to traffic from M-43/Grand River Ave/Saginaw St northerly into Clinton Co, then turning westerly to a terminus at US-27 southeast of DeWitt. 1984 - A new northern freeway bypass of Lansing opens between I-96 (at Exits 89-91) and the US-27/US-127 interchange near DeWitt and is designated US-27, itself now running northerly from its original route, via I-96 from Exit 98 northerly to Exit 91, then easterly across the north side of Lansing back to its original routing near DeWitt. All of the former US-27 between I-96 (at Exit 98) and US-127 (near DeWitt) is redesignated as BUS US-27. This new 8-mile long freeway, while designated only as US-27 in 1984, will later be incorporated into the completion of I-69 through the Lansing metro area. At this time, TEMP I-69 still bypasses Lansing on the south and east via I-96, I-496/US-27 and US-127. 1987 - With the opening of a new segment of I-69 freeway between US-127 and Peacock Rd in southeastern Clinton Co in late 1987, the I-69 designation is re-routed via I-96/US-27 northerly from I-96 at Exit 98 southwest of Lansing, northerly to Exit 91, then easterly across the north side of Lansing concurrently with US-27, to DeWitt, then easterly via US-127 for an additional 2 miles, before heading easterly along the 6 miles of new freeway. 1998 (Aug 31) - At 9:17am on Monday, August 31, 1998, the northbound lanes of the final link in the long-awaited US-27 "St Johns Bypass," as it is referred to locally, was opened to through traffic. The southbound lanes opened within a couple hours of the northbound side. With the opening of the new freeway, US-27 gains almost 3.6 miles, while US-127 loses about 1.7 miles in length. This was caused by the US-27 designation replacing the US-127 designation along I-69 between Exits 87 & 89 near DeWitt. No changes are made in the routing of I-69. 1999 (Apr 16) - MDOT, unhappy with the 89-mile concurrent designation of I-69/US-27, which has been in place since the late-1960s, petitions AASHTO's Standing Committee on U.S. Route Numbering to first truncate the US-27 designation at DeWitt and extend the US-127 designation northerly from DeWitt to I-75 at Grayling in Northern Michigan, then immediately petitions AASHTO to completely remove the rest of the US-27 designation from the state as well. This action adds approximately 140 miles to a highway previously only having about 85 miles in Michigan! It will take MDOT the next few years to first prepare for the massive changeover, then swap out the hundreds of route markers. 2002 (May) - The Big Changeover from US-27 north of Lansing to US-127 occurs. Starting in May in the Bay and North Regions (Gratiot, Isabella, Clare and Roscommon Counties), new US-127 markers go up along the freeway and the various Business Connections. It would take the University Region several more months to change over the signs in Clinton Co, however, meaning for a time, US-127 ends at DeWitt where US-27 picks up, then US-27 itself "fades away" in Gratiot Co replaced by US-127 again! In the end, this signals the demise of US-27 in Michigan. From southern jct with M-50 southeast of Jackson to Livingston Rd north of St Johns. Bagley Rd southeast of Ithaca to northern terminus at I-75 south of Grayling. NHS: From US-223 to northern terminus at I-75 south of Grayling. Business Connections: BUS US-127 - Jackson. From jct US-127 & M-50 southeast of Jackson to jct US-127, I-94 & M-50 northwest of downtown. BUS US-127 - Lansing. From CAPITOL LOOP/E Michigan Ave in downtown Lansing to I-69 at Exit 87 (Old 27) southeast of DeWitt. BUS US-127 - St Johns. From Price Rd interchange south of town to Old 27 interchange north of the city. BUS US-127 - Ithaca. From Washington Rd interchange east of Ithaca to Polk Rd interchange northeast of town. BUS US-127 - Alma. From Lincoln Rd interchange east of town to Alger Rd interchange north of the city. BUS US-127 - St Louis. From State Rd interchange south of the city to M-46/Monroe Rd interchange west of town. BUS US-127 - Mt Pleasant. From southeast of the city to north of the city. BUS US-127 - Clare. From south of Clare to Clare Ave (Old 27) interchange north of Clare. BUS US-127 - Harrison. From M-61 interchange southeast of downtown to Clare Ave (Old 27) interchange north of Harrison. Weblinks:  US-127 @ Michigan Highway Ends - photos of the termini of US-127 at Dan Garnell's excellent Michigan Highway Ends website. Notes: One of four north-south cross-peninsular M-numbered state highways in the Upper Peninsula. M-129 had been M-12 in the pre-US Highway days, and later became the original routing of US-2 in this area before the more modern and shorter Mackinac Trail routing was completed. The highway's first post-US-2 designation was M-121 before it was redesignated as M-5, but was later 'upped by eight' from its old route number to become M-129. History: 1927 - Several official and quasi-official sources indicate the first iteration of M-129 debuts on a short spur trunkline route beginning at US-2 five miles east of Marenisco in Gogebic Co running easterly to the Gogebic Co Park at the southern tip of Lake Gogebic, then northerly along the west shore of the lake to Lake Gogebic State Park. Interestingly, the Official State Trunkline Determination maps make no mention of this spur route and they indicate this route was not assumed into the trunkline system until July 1, 1931! 1929 (Dec 2) - A new 9.3-mile long trunkline is determined beginning at US-2 in Marenisco and running southerly to the Wisconsin state line at Winegar (present-day Presque Isle), Wisc. This new route is given the designation of M-129 and it can be assumed the five miles of US-2 between Marenisco and the existing M-129 spur route to Lake Gogebic State Park is signed concurrently with M-129 at this time. 1930 - The first iteration of M-129 comes to an close at the exact time the second iteration begins! All of M-129 from Lake Gogebic State Park southerly to US-2, then westerly via US-2 to Marenisco, then southerly again to the Wisconsin state line is redesignated as a discontinuous portion of M-64. (The other "new" portion of M-64 runs from Ontonagon westerly to Silver City.) The second iteration of M-129 in Michigan begins when a short section of trunkline in central Keweenaw Co is given that designation. This particular highway has been the short-lived home to several designations. Until 1926, it is one of three M-15 spurs in Keweenaw Co, all bearing the same route designation! From 1926-1928, this highway is designated M-9 when it is then renumbered as M-64 from 1928-1930, until that designation is transferred to a route from Ontonagon westerly and from Lake Gogebic State Park southerly. In 1930, the five mile spur highway from US-41 two miles east of Phoenix northeasterly via Copper Falls to Eagle Harbor is again re-designated, this time as M-129. 1933 (Jul 12) - A new 11.1-mile long state trunkline highway is determined from Eagle Harbor easterly along the Lake Superior shore to US-41 at Copper Harbor and is designated as an easterly extension of M-129. 1935 - In mid-1935, the M-26 designation is extended northeasterly with US-41 from Calumet/Laurium to central Keweenaw Co, then northeasterly via M-129 to Eagle Harbor and easterly to Copper Harbor, where it now terminates. Thus, the M-129 designation is completely supplanted in the process and bringing the first iteration of the M-129 routing to a close. 1960 - The final stretch of gravel-surfaced M-129, just south of Sault Ste Marie, is paved. 1963 (Jan 25) - The 2/10 mile spur of M-129 in Cedarville south of M-134 into the center of town is turned back to local control, moving the southern terminus of M-129 north to M-134. 1967 (Oct 27) - A very minor realignment at the northern end of M-129 bends the highway westerly to "T" into BS I-75 in Sault Ste Marie at a 90-degree angle. The route of M-129 shrinks by 1/10 mile in the process. Freeway/Expwy: No portion of M-129 is freeway or expressway. Circle Tour: Lake Superior Circle Tour: From southern jct of M-48 south of Pickford to northern terminus at BS I-75 in Sault Ste Marie. Weblinks:  M-129 @ Michigan Highway Ends - photos of the termini of M-129 at Dan Garnell's excellent Michigan Highway Ends website. PLEASE NOTE: The US-131 route information has moved to its own page: US-131 Route Listing. PLEASE NOTE: The M-134 route information has moved to its own page: M-134 Route Listing. Notes: The route of M-136 has undergone little change in its existence, only being extended easterly in the early-1960s. History: 1931 (Feb 18) – Capt S.J. Stewart, resident maintenance engineer for the State Highway Dept, announces that the entirety of M-13 in Saint Clair Co running from M-19 at Brockway easterly via Avoca to M-51 south of North Street is redesignated as M-136. The new M-136 designation also joins M-51 between North Street and Port Huron, as some sources indicate M-13 had done formerly, as well. This signals the end of the second iteration of M-13, which lasted just shy of four years, and marks the debut of the M-136 route designation to the state trunkline highway system. 1940 - The route of M-136 is completely hard-surfaced throughout. 1962 (Jun 30) - M-51 from M-136 near Gardendale northerly through North Street, Jeddo, Croswell to Carsonville is turned back to local control and the portion of M-51/M-136 from M-136 southeasterly to US-25A (present-day M-25) becomes just M-136 with the removal of the concurrent M-51 route markers. Freeway/Expwy: No portion of M-136 is freeway or expressway. Weblinks:  M-136 @ Michigan Highway Ends - photos of the termini of M-136 at Dan Garnell's excellent Michigan Highway Ends website. Notes: M-137 primarily provides state highway access from US-31 to the community of Interlochen, the Interlochen Center for the Arts, and Interlochen State Park. Even though the routes are within approximately six miles of each other, M-137 has never connected with M-37. In fact, M-137 was in existence long before M-42 in this area was redesignated as a part of M-37. History: 1929 (Dec 2) - The very early history of the M-137 designation is somewhat murky. On this day, two new state trunkline spurs are officially assumed into the system: one from US-2 at White Dale (present-day Gulliver) in southeast Schoolcraft Co easterly 7.8 miles to the Schoolcraft/Mackinac Co line, the other from US-31 at Interlochen Corners in western Grand Traverse Co southerly 2.0 miles through Interlochen to the Interlochen State Park. 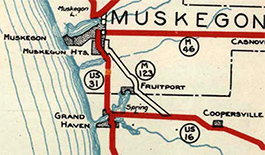 Official maps for 1930 show the Schoolcraft Co route designated as M-137, while the number for the Grand Traverse Co route is not indicated. Then on 1931 official maps, the Schoolcraft Co route is shown as M-99 while the M-137 designation as been applied to the Interlochen highway. In any event, it is clear by 1930, M-137 has been permanently assigned to the Grand Traverse Co routing. 1931 (June 19) - The State Administrative Board approves a 0.9-mile extension of M-137 through Interlochen State Park as part of a total of 30 additional miles of roadway approved to be added to the trunkline sytem. 1931 (Aug 17) - The 0.9-mile southerly extension of M-137 south of Interlochen State Park is officially determined. 1956 (Mar 6) - The 1.3 miles of M-137 from just north of Diamond Park Rd in Interlochen southerly to the southern terminus is cancelled as a state trunkline when a new, more-flowing alignment is assumed into the system. The former route via Eugene Ormandy Ave & Frederick Stock Ave (on the Interlochen Center for the Arts campus) is turned back to local control, while the portion to the east of the new alignment through Interlochen State Park is abandoned and the road is obliterated. Freeway/Expwy: No portion of M-137 is freeway or expressway. Weblinks:  M-137 @ Michigan Highway Ends - photos of the termini of M-137 at Dan Garnell's excellent Michigan Highway Ends website. Notes: An extension of M-24 between Caro and Unionville was completed in 1997. Plans were to have the M-24 designation replace the M-138 designation along Unionville Rd between Akron Rd and M-25 in Unionville. However, the 1997 and 1998 Official Michigan Highway Maps showed M-138 still running along that route with M-24 ending at M-138. Through a field checking trip, the reality is that M-138 now ends at M-24 (cnr Unionville Rd & Akron Rd) two miles east of Akron and M-24 continues northerly via the former M-138/Unionville Rd into Unionville. The 1999 highway map correctly shows this change. Prior to the completion of the M-24 extension from Caro to Unionville, M-138's total length was 26.15 miles. History: 1926-30 - The early history of M-138 is somewhat unclear and confusing. In the early-1920s, the route of M-81 begins in Bay City and runs southeasterly via present-day M-15 to present-day M-138, then easterly through Munger into Tuscola Co, southerly via Bradleyville Rd to present-day M-81, then easterly via Caro to M-53. At the same time, M-31, which runs from Harbor Beach via Bad Axe and Sebewaing to Saginaw, travels southerly from Unionville via present-day M-24, then westerly via present-day M-138 via Akron and Fairgrove to Bradleyville Rd and M-81 coming from Bay City and Munger. On Bradleyville Rd, M-31 & M-81 run concurrently southerly to present-day M-81, where M-31 turns westerly via present-day M-81 into Saginaw. In c.1925, M-31 is realigned to run from Unionville to Bay City via present-day M-25 and, as a result, M-81 is routed westerly from Watrousville through Reese to Saginaw, replacing M-31 along that segment. The former M-31 from Unionville via Akron and Fairgrove to M-81 at the cnr of Bradleyville Rd is redesignated as M-84, while the portion of M-81 via present-day M-15 from Bay City southeasterly becomes a northerly extension of M-24. This leaves the portion of the former M-81 from M-24 (present-day M-15) easterly through Munger to Bradleyville Rd in Tuscola Co without a route designation! Maps do not show any route number on this roadway from 1926-1930, although official State Highway Dept sources do NOT indicate it was transferred to local control. In c.1928, the M-84 routing from Unionville southwesterly via Akron, Fairgrove and Gilford loses its M-84 designation and is signed as a northeasterly extension of M-83, while present-day M-138 still bears no route number. 1931 - Beginning in 1931, official route maps begin indicating the state trunkline from M-24 (present-day M-15) in Bay Co easterly via Munger Rd through Munger and into Tuscola Co via Fairgrove Rd to M-83/Bradleyville Rd as M-138. 1939 (Jul 13) - The route of M-83 via Bradleyville Rd between M-81 at M-138 is transferred to local control, thereby severing M-83 into to parts, with the southern segment retaining the M-83 designation. The portion of M-83 in Tuscola Co via Fairgrove Rd easterly from M-138 to Fairgrove, then northerly via Hinson Rd to Akron Rd, easterly via Akron Rd through Akron to Unionville Rd, then northerly via Unionville to M-25 in downtown Unionville becomes an extension of M-138. With this extension, M-138 reaches is "classic routing" which would not change for 55 years. 1940 - The last segment of gravel-surfaced M-138, from the Bay/Tuscola Co line easterly to Bradleyville Rd, is hard-surfaced. 1997 - The M-24 extension north of Caro opens to traffic. From M-81 in Caro, the extension runs northerly for 1.5 miles via Cleaver Rd, then westerly for 4 miles on newly-built highway, then northerly again along Unionville Rd to M-138 east of Akron. From there, M-24 replaces the M-138 designation northerly into Unionville. The eastern terminus for M-138 now becomes M-24 at the cnr of Akron & Unionville Rds. Freeway/Expwy: No portion of M-138 is freeway or expressway. Weblinks:  M-138 @ Michigan Highway Ends - photos of the termini of M-138 at Dan Garnell's excellent Michigan Highway Ends website. Notes: It is ironic that M-139 was originally conceived as an easterly bypass of the Benton Harbor/St Joseph area in the late-1920s, yet for much of its history the route was used as an access into the area from the two subsequent bypasses—I-94 in the 1960s and US-31 in the 2000s. Starting in 2010, however, M-139 took over the former route of US-31/US-33 from Berrien Springs into Niles and replaced the western half of the BUS US-12 designation in Niles, drastically increasing its length and useage. With the extensions in the 2000s and 2010s, M-139 still only exists within Berrien County. In a city never devoid of state trunkline routing changes, reroutings and alterations, yet another major highway designation took place in March 2010 when MDOT and the City of Niles came to agreement about the four blocks of Main St through the downtown core of the city. Reportedly due to truck traffic using the BUS US-12 route throug downtown Niles and the City's inability to curb such useage, the City began talks with MDOT to take over jurisdiction of the short segment of BUS US-12 between the BUS US-31/Front St (now M-139) and M-51/5th St junctions. Upon viewing a map of the Niles area, one notes this is a rather short segment of trunkline transferred to local control, yet it resulted in a gap in an otherwise complete business routing through town. Coinciding with the extension of M-139 from Berrien Springs southerly to Niles along the former routes of unsigned OLD US-31 and the orphaned BUS US-31 route, MDOT was able to make sufficient routing changes to accommodate the transfer, although some may remark the resulting arrangement of highway routes into and through the city is somewhat "awkward." Longtime site visitor/contributor Marc Fannin wrote in with an interesting factoid: Along the portion of M-139 from I-94 southerly to Scottdale which was superceded by the US-31 designation for nearly forty years (c.1964-2003), the physical street name for the addresses for the homes and businesses along that stretch of roadway remained "M-139" even though the route number was US-31 all those years! —Thanks Marc for the info! M-139's length from 2003 to 2010 was 11.82 miles prior to being extended to Niles. History: 1929 (Sept 2) - A new 8.2-mile long state trunkline is determined in the Benton Harbor area, generally acting as an easterly bypass of the Benton Harbor-St Joseph area beginning at US-31 at Scottdale and running almost due northerly to a yet-to-be-determined shoreline routing of US-31 from St Joseph to Hagar Shores. However, none of the route is yet constructed at this time. 1931 - M-139 from US-31 at Scottdale northerly to Napier Ave is completed and opened to traffic. Sources indicate this year is the first where M-139 likely appears signed in the field from US-31 at Scottdale northerly to Nickerson Rd, then northwesterly via Nickerson to Ogden Ave northerly via Ogden to Empire Ave, westerly via Empire to Broadway Ave and northerly again via Broadway to Pipestone St, then northwesterly via Pipestone to US-12/US-31/W Main St in downtown Benton Harbor. Official documents, however, indicate the Napier-Nickerson-Ogden-Empire-Broadway-Pipestone route is not an officially established trunkline, rather just a marked-and-maintained routing while the rest of the "official" M-139 is being constructed. 1933 - M-139 from Napier Ave northerly to Pipestone Rd is completed and opened to traffic and M-139 traffic is now directed northerly from Nickerson Rd via M-139 to Pipestone Rd, then northwesterly via Pipestone to US-12/US-31/W Main St downtown Benton Harbor. As with the previous in-town routing, which was only marked-and-maintained but never assumed into the trunkline system, Pipestone St from M-139 northwesterly into downtown is only marked-and-maintained. 1935 - A slight realignment to the marked-and-maintained-only route of M-139 in downtown Benton Harbor removes M-139 from Pipestone between Wall & Main Sts. Traffic is now directed easterly via Wall St and northerly via Market St to US-12/US-31/Main St.
1936 - Late this year, construction is completed on M-139 from Pipestone Rd northerly to Britain Ave where M-139 traffic is then directed northerly via Fair Ave to a new northern terminus at US-12/E Main St. The former route via Pipestone St, Wall St & Market St was never officially assumed as a trunkline and, therefore, remains in local control. 1954 (Jan 25) - The new direct route of US-31 from downtown St Joseph northeasterly to Paw Paw Ave north of Benton Harbor (via present-day M-63) is officially assumed into the state trunkline system. The former route of US-31 via Paw Paw Ave from the new alignment north of Benton Harbor southerly into downtown is redesignated as M-139, while US-12/E Main St between Paw Paw Ave and M-139/Fair Ave becomes concurrently signed with M-139 to connect the two segments. It is important to note that the portion of M-139 via Paw Paw Ave between Riverside Dr and downtown Benton Harbor runs via a marked-and-maintained-only route, meaning this portion of Paw Paw is not officially assumed into the trunkline system. Rather the State Highway Dept still hopes to construct M-139 on a direct alignment between the north end of Fair Ave and Paw Paw Ave at Riverside Dr.
1961 (Jan 6) - In conjunction with the completion of the I-94/US-12 freeway bypass of Benton Harbor and St Joseph, M-139 immediately south of the new freeway to the St Joseph River bridge is realigned and the former route, via Old M-139, is turned back to local control. 1963 - The first segment of the I-96/US-31 freeway is completed from I-94 at Exit 34 northerly to the Hagar Shores area in northern Berrien Co. US-31 is rerouted beginning at Scottdale to run northerly with M-139 from US-31/US-33 to the new I-94 freeway, then northeasterly via I-94 to I-96 (present-day I-196), then northerly via I-96 to Hagar Shores. 1964-65 - At some point in late-1964 or early-1965, M-139 is truncated at the I-94 & US-31 interchange south of Benton Harbor. The formerly-concurrent US-31/M-139 from there southerly to Scottdale becomes just US-31. 1969 (Aug 26) - All of M-139, both the marked-and-maintained portion via Paw Paw Ave from BL I-94/Main St in Benton Harbor northerly to Riverside Dr and the official trunkline portion of Paw Paw Ave from Riverside northerly to US-33 (present-day M-63), is removed from the state trunkline system. In addition, the never-built portion of M-139 from the north end of Fair Ave northerly to the cnr of Paw Paw Ave & Riverside Dr is also cancelled. 1973 (Sept 14) - A new 0.993-mile long state trunkline routing is determined from M-139 just north of Empire Ave northerly on new alignment to Highland Ave, then northerly via Pine St to BL I-94/E Main St. This new route becomes the northbound side of M-139 (Martin Luther King Jr Dr), while the existing M-139 via Fair Ave from BL I-94/E Main St southerly to the intersection with the new trunkline routing becomes the southbound only lanes. 2003 (Aug 27) - A 9.1-mile extension of the US-31 freeway in Berrien Co is opened to traffic, connecting the northern end of the existing freeway at Berrien Springs with Napier Ave east of Benton Harbor. This is the fourth of five informal "phases" of the freeway in Berrien Co and it removes through traffic off the rather dangerous former route of US-31 between Berrien Springs and I-94. The former route of US-31 between the freeway at Berrien Springs (at Exit 15) and I-94 south of Benton Harbor/St Joseph is redesignated as an extension of M-139, instead of an extension of M-63 as had been originally proposed and confirmed by several MDOT documents. 2010 (Mar 10) - While the extension of M-139 from its southern terminus at the US-31 freeway at Berrien Springs to downtown Niles was already being planned, a new development in downtown Niles resulted in the transfer of four blocks of the BUS US-12 route beginning at the BUS US-31 (soon-to-be M-139) to city control. As MDOT would not allow for a gap in the existing route of BUS US-12, the M-139 designation is now further extended southwesterly from downtown Niles, supplanting the western half of the former BUS US-12 route. M-139 now terminates at US-12 southwest of Niles. Freeway/Expwy: No portion of M-139 is freeway or expressway. Weblinks:  M-139 @ Michigan Highway Ends - photos of the termini of M-139 at Dan Garnell's excellent Michigan Highway Ends website.  Michiana Roads - part of Marc Fannin's Roadfan.com website dedicated to the area of Southwest Michigan and Northern Indiana known by many as "Michiana."